Many individuals have contributed to the success of Florida agriculture. Four of them were recognized at the 2016 Florida Agricultural Hall of Fame Banquet on Feb. 9. 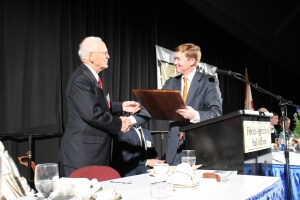 Held at the state fairgrounds in Tampa, the event featured Kevin Folta, chairman of the UF/IFAS Horticultural Sciences Department, as master of ceremonies and Agriculture Commissioner Adam Putnam as the presenter of the newest Ag Hall of Fame inductees. This year’s class included Tom Braddock, a former Duval County Extension director, Chip Hinton of Hillsborough County, Joe Joyce of UF/IFAS, and Billy Kempfer, a rancher who operates a diversified beef cattle, timber and sod business in Osceola and Brevard counties. For more information, visit http://floridaaghalloffame.org/.